I have a long list of things I want to make ... endless in fact. But this week has been super frustrating for two reasons 1) I haven't seemed to have 'done' as much as I wanted and 2) Fun Fur yarn. It all seemed like such a good idea to knit a fluffy bunny - it was going to be fluffy, cute and wonderful. But something went horribly wrong ... Fun Fur is easy to knit with - but once you have knitted - you can't see anything - and I mean anything - the fur is rather furry (erm .. perhaps I hadn't appreciated the 'fur' part in the label) and you can't count your stitches - see your seams - its just a mass of fur. Regardless of all this flying fuzz - I feel there is potential in the little fur ball (below is his fluffy side profile) ... but maybe he wasn't meant to be a bunny? Perhaps he is a bear? or a doggie? or a tiger? or just a good old fashioned yeti? LOL! This is probably how the wombles got invented, and look how popular they became! I love your furry rabbit! That yarn adds some nice texture. 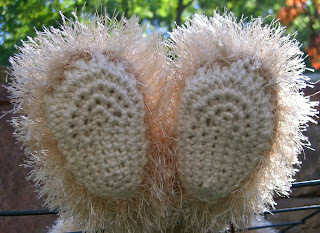 His little feet with his crochet soles are especially endearing. Hope you figure out how to add some facial details - otherwise you could knit him a balaclava and some snow shoes! oh Rachael I FEEL your frustration! I'm impressed you perservered and I know I would definitely have trimmed the face as well - I agree with the former comment - I can see a womble! But his feet are gorgeous! You are a very talented knitter! You made me giggle! I know what you mean about the furry yarn, been there done that! 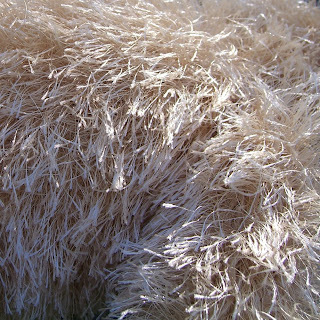 If you happen to drop a stitch you might as well forget it, finding a needle in a haystack would be easier. As an after thought you could turn him into a Yeti! Oh fun fur...always better in theory than in practice. If it isn't a rabbit, then I'd vote Abominable Snowman/creature. I'm sure that in some part of the world little children are crying out for their very own yeti. here is a unique marketing opportunity.